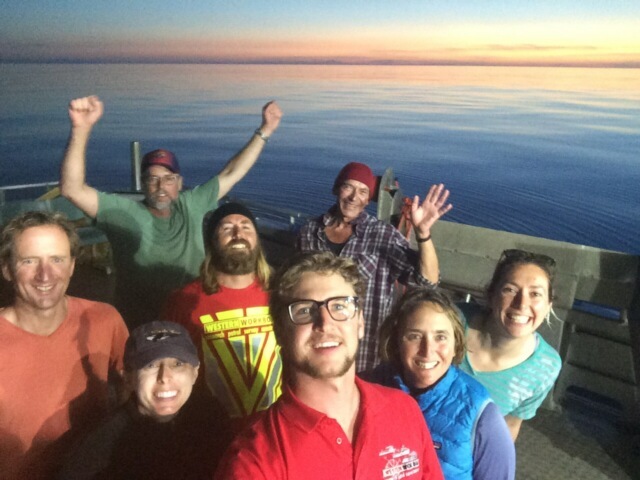 8:35pm on February 20th found the blue whale team smiling, singing, and dancing on the aft deck of the R/V Star Keys as the light faded and the sky glowed orange and we marked our final waypoint of the 2017 blue whale field season. What preceded was a series of days so near perfect that we had barely dared dream of the like. Sighting after sighting, and our team of scientists and the wonderful Star Keys crew began to work like a well-oiled machine—approach the whale gently and observe its behavior, fly the drone, deploy the CTD and echosounder, approach for photos, launch the small boat, approach for biopsy, leave the whale, re-apply sunscreen, find another whale, repeat. 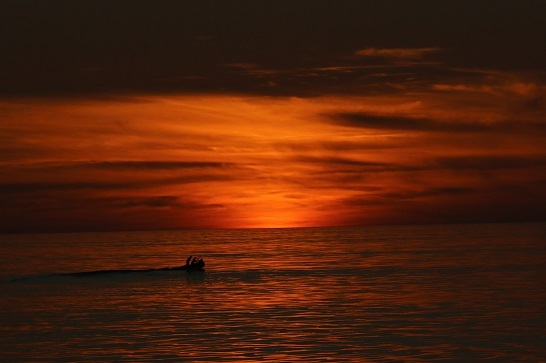 This series of events continued from sunrise until sunset, when the sky and water were painted brilliant colors. The sound of big blue whale breaths broke the silence over the glassy water, and the plumes of exhaled air lit up in the last bits of sunlight, lingering there without even a puff of wind to blow them away. A blue whale mother and calf surface in front of Farewell Spit in calm conditions as the daylight starts to fade. Photo by Leigh Torres. The small boat returns to R/V Star Keys after collecting the final biopsy sample of the season. Photo by Dawn Barlow. Despite coming to New Zealand during the “worst summer ever”, I’m pleased to say that this has been the most fruitful field season the New Zealand blue whale project has had. We covered a total of 1,635 nautical miles and recorded sightings of 68 blue whales, in addition to sightings of killer whales, pilot whales, common dolphins, dusky dolphins, sharks, and many seabirds. Five of our blue whale sightings included calves, reiterating that the South Taranaki Bight appears to be an important area for mother-calf pairs. Callum and Mike (Department of Conservation) collected 23 blue whale biopsy samples, more than twice the number collected last year. Todd flew the drone over 35 whales, observing and documenting behaviors and collecting aerial imagery for photogrammetry. We took 9,742 photos, which will be used to determine how many unique individuals we saw and how many of them have been sighted in previous years. 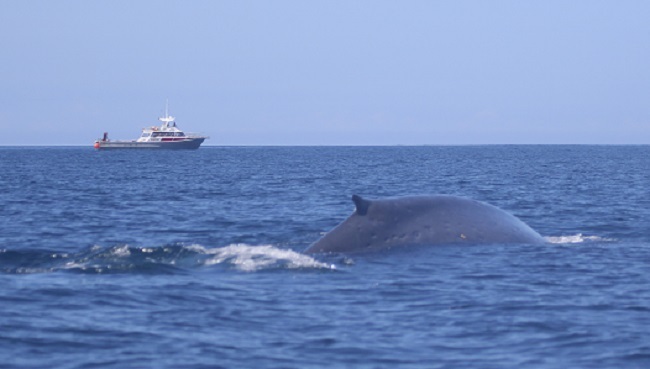 A blue whale surfaces with R/V Star Keys in the background. Photo taken from the small boat by Leigh Torres. It is always hard to see a wonderful thing come to an end, and we agreed that we would all happily continue this work for much longer if funding and weather permitted. But as the small skiff returned to the Star Keys with our final biopsy sample and the dancing began, we all agreed that we couldn’t have asked for a better note to end on. There has already been plenty of wishful chatter about future field efforts, but in the meantime we’re still floating from this year’s success. I will certainly have my hands full when I return to Oregon, and in the best possible way. It feels good to have an abundance of data from a project I’m passionate about. 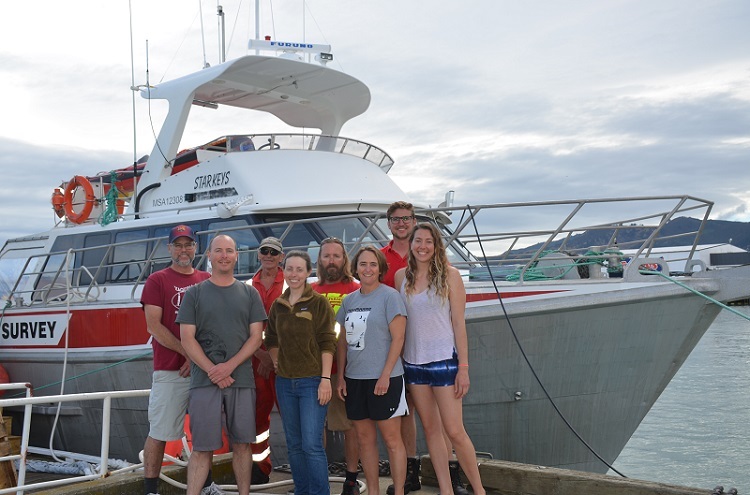 Thank you to Western Work Boats and Captain James “Razzle-Dazzle” Dalzell, Spock, and Jason of the R/V Star Keys for their hard work, patience, and good attitudes. James made it clear at the beginning of the trip that this was to be our best year ever, and it was nothing less. The crew went from never having seen a blue whale before the trip to being experts in maneuvering around whales, oceanographic data collection, and whale poop-scooping. Thank you to Callum Lilley and Mike Ogle from the Department of Conservation for their time, impressive marksmanship, and enthusiasm. And once again thank you to all of our colleagues, funders, and supporters—this project is made possible by collaboration. Now that we’ve wrapped up, blue whale team members are heading in different directions for the time being. We’ll be dreaming of blue whales for weeks to come, and looking forward to the next time our paths cross. Blue whale team members in front of R/V Star Keys in port in Nelson. The team rejoices after a magnificent final survey day! It was great talking on the VHF when ‘Star Keys’ passed near our gaff ketch ‘New Zealand Maid’ on your final day (you en route to Wellington, we sailing up the west coast direct Picton to North cape. Barbara had seen two whales during the previous 3 hours, more or less on the rhumb line Stevens Island to Cape Egmont, (about a third of the way from Stevens Is). 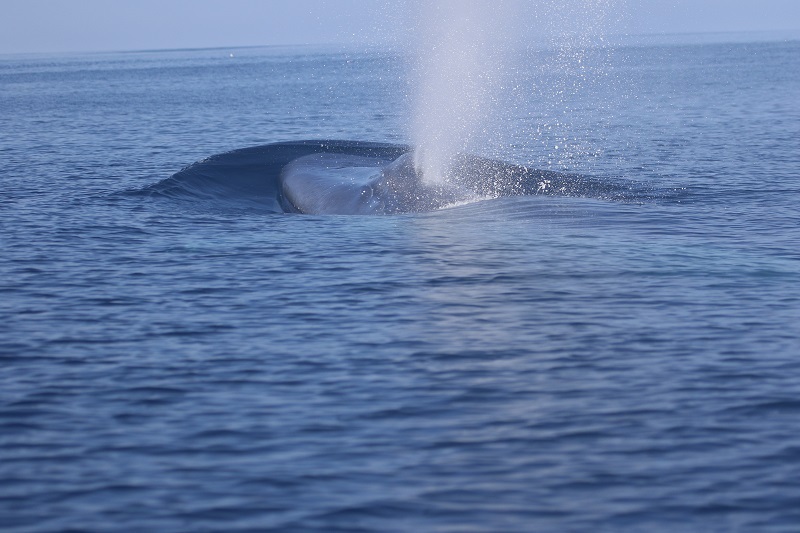 They were both very large logging whales, but we had no idea that they might be Blue Whales. Very exciting. 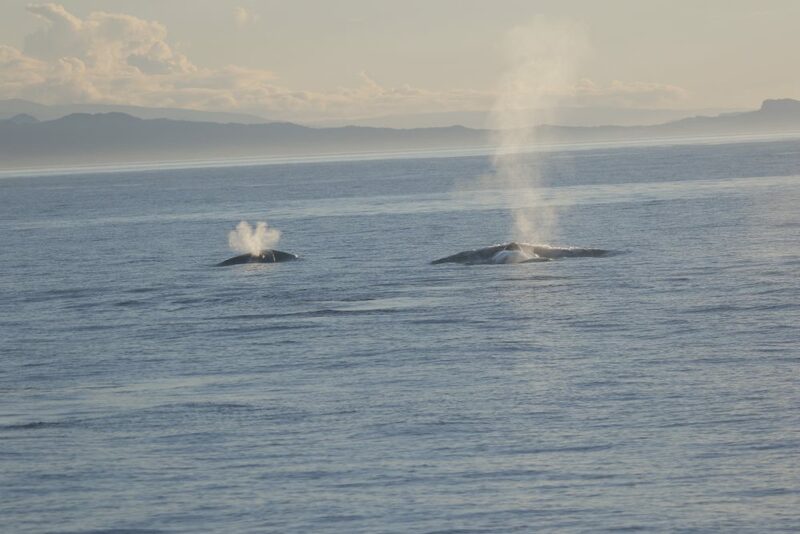 We’ve seen unidentified baleen whales off the west coast in the past, from Cape Reinga to Greymouth when we were running a fishing ketch trolling for albacore in 1995 & 96, usually in areas of plankton-rich upwellings which were identifiable from the bathy charts. We’ve also worked aboard French, Australian (and a chartered Russian) icebreakers doing oceanographic work off the Eastern Antarctic coast. I’m curious whether it is possible that the STB population may be descended from remnants of the Blue Whale population which was hunted out of the Ross Sea in the early 20th century, and hasn’t returned. Have you any way of making a connection? For the record, our best friends, Nick and Cath Gales live next door to us on an island in SE Tasmania. Nick has worked on the Grey whale survey off the Californian coast and is now director of the Australian Antarctic Division. I’m forwarding this blog site to him as I’m sure that he and his marine bio team will be interested. Hi Jon and Barbara, It was fun to chat with you over the radio! Interesting to hear that you saw whales earlier in the day – it’s entirely possible that they were blues since we saw many that day, several in the area that you describe. It sounds like you guys are very well-traveled! If you happen to come across any more blue whales in New Zealand waters in your upcoming adventures, we’d certainly love to hear about it. Thanks for the support and for passing the word along about our work. I’ll be updating the blog with more blue whale news as we dive into analyzing all of the data we collected this past season!